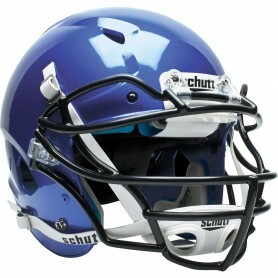 Football America UK stocks high quality adult football helmets from Riddell, Schutt, Rawlings, and Xenith. Football America UK offers the most cutting edge, comfortable, lightweight and durable helmets in the market at affordable prices. The SpeedFlex, features The Flex System, with flexibility engineered into the helmet’s shell, face mask and face mask attachment system with hinge clips to help reduce impact force transfer to the athlete. The SpeedFlex also features Riddell’s Patented Side Impact Protection and All-Points Quick Release face mask attachment system. Helmet comes standard with soft cup ratchet system chin strap. After much anticipation, the Riddell SpeedFlex Adult Helmet has arrived and is poised to change the way we look at football helmets. Built with the latest technological features to lower force from impacts at high and low velocities, the Riddell SpeedFlex is like no other helmet on the market. With its distinctive styling, that includes a flexible panel on the front of the helmet and a Rachet-Loc chinstrap, the SpeedFlex surely distances itself from the pack. To further that point, the helmet ranked number one in the Virginia Tech Helmet Ratings released in October of 2014 and became the first helmet to score under 0.2 in STAR Value. Xenith introduces its newest innovation, the EPIC football helmet. New integrated technologies come together to deliver the ultimate in helmet fit, comfort and protection. The EPIC is the next generation of Xenith Adaptive Head Protection®. The EPIC helmet features brand new shell geometry with more ventilation and increased rigidity for improved impact protection. In addition, a new liner design features next generation Aware Flow® shock absorbers with a stepped wall for multi-stage impact absorption to adapt even more effectively to low and high energy hits. Four varied shock heights are strategically placed throughout the liner to achieve tailored protection in all locations. An improved comfort padding system uses waterproof TPU covering that is easily cleaned and won’t absorb sweat. The EPIC’s multi-density construction, featuring Poron® XRD® foam, provides added comfort and protection. EPIC features the new and unique FItLock, which is an injected foam pad providing enhanced comfort and fit to help keep the helmet on your head. The EPIC is compatible with all existing Xenith facemask designs and accessories, including Xenith’s 3 new style facemasks – Prime, Prowl and Pursuit. Note: Any player in any sport can sustain a head injury with even the very best head protection. This analysis is based on data trends and probabilities, and therefore a specific person's risk may vary. This variation is likely dominated by genetic differences, health history, and impact factors such as muscle activation. The X2E features the same Adaptive Head Protection® technology as previous versions, with two exciting improvements derived from the development of the EPIC helmet. The X2E utilizes optimized shock absorbers that are specifically tuned for each location in the helmet and maximize the space for enhanced performance. The X2E also features new comfort pads made of waterproof TPU. The new pads are more comfortable, durable, easier to clean and more hygienic. Hybrid Chin Cup features non-slip interior liner with hard cup exterior for additional protection. New Speed Icon is a mix of the traditional Speed design with some SpeedFlex additions. Using the shell of the Riddell Speed helmet and similar internal parts to the SpeedFlex, the new Speed Icon offers the traditional look of the Speed helmet with greater comfort and stability of Riddells latest internal technology. The Speed Icon is designed to use the new lightweight HS4 facemasks, high strength spring stainless steel; thinner and lighter, high performance improves sight and field vision. Using the Riddell quick release system with a simple press of a button. Quick change liner attachment system, removable padding system with screw in caps, designed for ease of use when removing or inserting inner padding. Upgraded internal padding with new Nubuck overliners for better comfort and stability. The latest in Schutt's iconic Vengeance line, the Schutt Vengeance Z10 Adult Football Helmet with Unattached Titanium Facemask uses a smaller profile and a new Helmet Stabilization System to appeal to even more players. 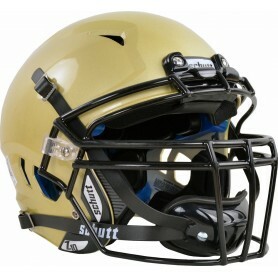 The helmet requires a titanium facemask to keep the weight down and a hard cup SC-4 chinstrap to keep the protection up. The first thing you'll notice when putting on the Z10 is the streamlined shell that sits closer to your head like a classic helmet. But this helmet is far from classic, using an external cheek stabilizer that boosts the strength of the ear flaps and an internal piece that gives you a locked in feeling. Extra vent holes keep the helmet breathable, while the single layer TPU keeps it light on your head. The titanium facemasks are made to work in unison with the helmet, extending further back on the helmet than previous Vengeance facemasks with a material that's 60% lighter than traditional facemasks. Feel the difference this season with the Vengeance Z10! The Q10 has TPU cushioning throughout, offering consistent performance over all temperature ranges, and a comfy SUREFIT air liner that allows you to adjust the fit of the helmet to suit your head shape. The Air XP shell is the most popular of Schutt's designs from the youth level to the NFL, where over 50% of skill players choose Schutt. With an included SC4 hard cup chin strap and your choice of facemask style and color, now is the time to upgrade your helmet to the Q10. Low Profile Vengeance Shell Design - Smaller standoff shell while still maintaining the flexural resistance back shelf and mohawk design for great look desired by players! Interlink Air Maxx TPU Jaw Pads - Comes standard with mechanically attached TPU jaw pads to stay securely in place and make changing sizes easy! 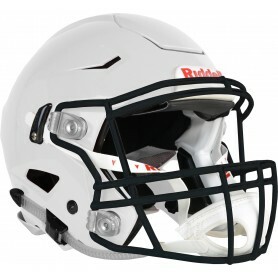 Based on the popular Revolution Speed family, The Riddell Foundation uses the same style shell as the Revo Speed, but does not utilise the QR facemask system. 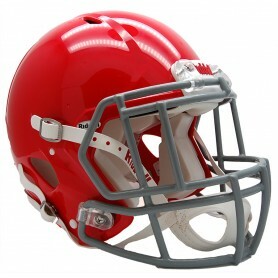 The Riddell Foundation uses the standard hardware kit which is provided with the helmet.